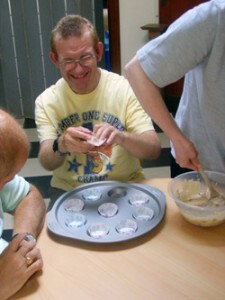 We are a long established vocational & educational centre for adults with learning difficulties. We strive to enable our students to improve the quality of their lives vocationally, educationally, socially and emotionally by enhancing their self esteem, increasing their personal growth and achieving the greatest level of independence possible. On our premises we have the benefit of large front and rear gardens which are secure. Inside we have a day room for relaxation and a cafeteria and kitchen where our students can choose their meals and beverages from our menu. There is also a large hall with a stage and work stations for our programme of activities. We also have our own mini buses and are able to transport our students. Active Lives now offers the opportunity for employment training having established our own on line store. Launched in 2014 www.shopfromapound.co.uk has developed into a very successful online retail channel and operated by our students and staff. Visits to our centre including taster days can be arranged for visitors who would like to explore what we are able to offer students enrolling at Active Lives and we also run annual events to which members of the public are welcome. Active Lives is committed to providing excellence through effective and professional programmes which will help our students to achieve their objectives and add value to their daily lives. Our aim is to provide enriching life experiences for adults with learning and physical difficulties in a safe positive and productive environment with freedom of choice independence and inclusion. Active Lives offers students a progressive and exciting programme of activity designed to stimulate and aid learning.